Granite memorial to the 23 workers killed during the Phillips Disaster of 1989. Photo Wikipedia. 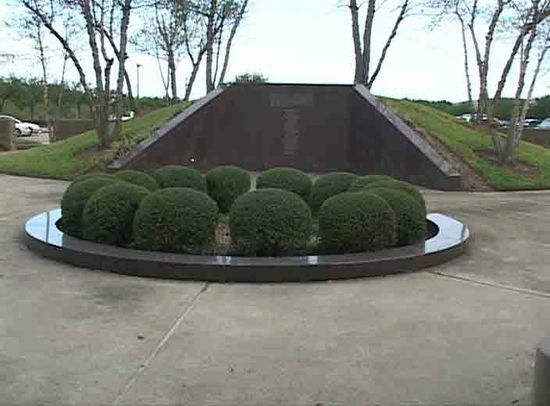 The Phillips Disaster of 1989 refers to a devastating series of explosions and fire on October 23, 1989 at Phillips' Houston Chemical Complex (HCC) near the Houston Ship Channel in Pasadena, Texas that left 23 employees dead and 314 injured. The initial blast registered 3.5 on the Richter Scale, and the conflagration took 10 hours to bring under control. The facility produced approximately 6.8 million tons per year of high-density polyethylene (HDPE), a plastic material used to make milk bottles and other containers. 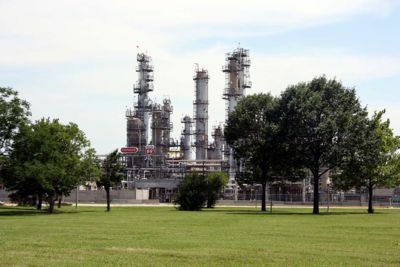 The Houston Chemical Complex (HCC) facility had 905 company employees and approximately 600 daily contract employees, who were engaged primarily in regular maintenance activities and new plant construction. The accident resulted from a release of extremely flammable Chemical process|process gases that occurred during regular maintenance operations on one of the plant's polyethylene Chemical reactor|reactors. More than 39 tons of highly flammable gases were released through an open valve almost instantaneously. During routine maintenance, isolation valves were closed and compressed air hoses that actuated them physically disconnected as a safety measure. The air connections for opening and closing this valve were identical, and had been improperly reversed when last re-connected. As a result, the valve would have been open when the switch in the control room was in the "valve closed" position. After that, the valve was opened when it was expected to stay closed, and finally passed the reactor content into air. A vapor cloud formed and traveled rapidly through the polyethylene plant. Within 90 to 120 seconds, the vapor cloud came into contact with an ignition source and exploded with the force of 2.4 tons of Trinitrotoluene|TNT. Ten to fifteen minutes later, that was followed by the explosion of the 76,000 Liter isobutane storage tank, then by the catastrophic failure of another polyethylene reactor, and finally by other explosions, probably about six in total. The incident started at approximately 1:00 PM local time on October 23, 1989, at 1400 Jefferson Road, Pasadena, Texas 77506. A massive and devastating explosion and fire ripped through the Phillips 66 Company's Houston Chemical Complex (HCC), killing 23 persons—all working at the facility—and injuring 314 others (185 Phillips 66 employees and 129 contract employees). In addition to the loss of life and injuries, the explosion affected all facilities within the complex, causing $715.5 million worth of damage plus an additional business disruption loss estimated at $700 million. The two polyethylene production Chemical plant|plants nearest the source of the blast were destroyed, and in the HCC administration building nearly 0.5 mile away, windows were shattered and bricks ripped out. The initial explosion was equivalent to an earthquake registering 3.5 on the Richter Scale and threw debris as far away as six miles. The initial response was provided by the Phillips 66 Company fire brigade which was soon joined by members of the Channel Industries Mutual Aid association (CIMA). Cooperating governmental agencies were the Texas Air Control Board, the Harris County Pollution Control Board, the Federal Aviation Administration (FAA), the U.S. Coast Guard, the Occupational Safety and Health Administration (OSHA) and the U.S. Environmental Protection Agency (EPA). The fire-fighting water system at the HCC was part of the process water system. When the first explosion occurred, some fire hydrants were sheared off at ground level by the blast. The result was inadequate water pressure for fire fighting. The shut-off valves which could have been used to prevent the loss of water from ruptured lines in the plant were out of reach in the burning wreckage. No remotely operated fail-safe isolation valves existed in the combined plant/fire-fighting water system. In addition, the regular-service fire-water pumps were disabled by the fire which destroyed their electrical power cables. Of the three backup diesel-operated fire pumps, one had been taken out of service, and one ran out of fuel in about an hour. Fire-fighting water was brought in by hoses laid to remote sources: settling ponds, a cooling tower, a water main at a neighboring plant, and even the Houston Ship Channel. The fire was brought under control within about 10 hours as a result of the combined efforts of fire brigades from other nearby companies, local fire departments, and the Phillips 66 foam trucks and fire brigade. All search and rescue operations were coordinated by the Harris County, Texas|Harris County (Texas) Medical Examiner and County Coroner. Search and rescue efforts were delayed until the fire and heat subsided and all danger of further explosions had passed. These operations were difficult because of the extensive devastation in the HCC and the danger of structural collapse on the search and rescue team. The Phillips 66 Company requested, and the FAA approved and implemented, a 1-mile no-fly zone around the plant to prevent engine vibration and/or helicopter rotor downwash from dislodging any of the wreckage. The U.S. Coast Guard and City of Houston fire boats evacuated to safety over 100 trapped people across the Houston Ship Channel. OSHA preserved evidence for evaluation regarding the cause of the catastrophe. OSHA's major findings included: Lack of process hazard analysis; inadequate standard operating procedures (SOPs); non-fail-safe block valve; inadequate maintenance permitting system; inadequate lockout/tagout procedures; lack of combustible gas detection and alarm system; presence of ignition sources; inadequate ventilation systems for nearby buildings; fire protection system not maintained in an adequate state of readiness. Additional factors found by OSHA included: Proximity of high-occupancy structures (control rooms) to hazardous operations; inadequate separation between buildings; crowded process equipment; insufficient separation between the reactors and the control room for emergency shutdown procedures. OSHA's investigation also revealed that a number of company audits, which were done by Phillips' own safety personnel as well as by outside consultants, had identified unsafe conditions, but had been largely ignored. "The catastrophe at the Phillips Complex underscored the need for effective implementation of good safety management systems in the petrochemical industry and raised questions about diffused responsibility for employee safety at worksites where one or more contractors are engaged in work for a company. OSHA had addressed this issue at construction sites, but not at petrochemical plants like the Phillips Complex, where an engineering contractor was regularly employed to perform key maintenance operations and was involved in the October 1989 disaster. The Department of Labor therefore determined that OSHA's investigation of this tragic accident would be broad in scope and would examine the underlying causes Vl1 '-"'consequences and that the Department would report to the President with findings and recommendations." "
A citation for willful violations of the OSH Act "general duty" clause has been issued to Phillips with proposed penalties of $5,660,000. In addition, citations with proposed penalties of $6,200 have been issued for serious violations in the areas of emergency response, emergency egress, inadequate pre-emergency planning, plant alarm systems, hazard communication, and respiratory protection. V1l1A citation for willful violations with proposed penalties of $724,000 has been issued to Fish Engineering and Construction ( a Phillips maintenance contractor) for failing to obtain the necessary vehicle and hot work permits when working in the polyethylene plant. Citations for serious violations with proposed penalties of $5,500 have also been issued for hazards involving inadequate respiratory protection and deficiencies in the company's hazard communication program; other than serious violations involving mainly recordkeeping issues resulted in an additional $100 proposed penalty." At the conclusion of the investigation (April 19, 1990), OSHA issued 566 Willful violations and 9 serious violations with a combined total proposed penalty of $5,666,200 to Phillips 66 Company and 181 Willful violations and 12 serious violations with a combined total proposed penalty of $729,600 to Fish Engineering and Construction, Inc., a maintenance contractor on the site. Willful violations, under OSHA, are "those committed with an intentional disregard of, or plain indifference to" OSHA safety rules. Serious violations are those with "substantial probability" of death or serious harm that the employer knew or should have known about. The fine against Phillips was the second-largest ever for a single inspection by the Labor Department's Occupational Safety and Health Administration (OSHA). "This tragedy is magnified by the clear evidence that this explosion was avoidable had recognized safety procedures been followed," said Labor Secretary Elizabeth Hanford Dole in a strongly worded statement. "OSHA has uncovered internal Phillips documents that called for corrective action but which were largely ignored." Gerard F. Scannell, head of OSHA, charged inadequate management commitment "to protect the lives and well-being of Phillips employees." 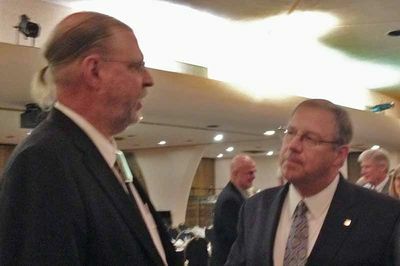 The labor union that represents Phillips' workers dismissed the proposed fine as representing "no real penalty. Much less will it be a deterrent to future tragedies resulting from current practices." Beyond this, the union professed doubt that the fine proposed would actually be levied, since "OSHA has a history of making deals." 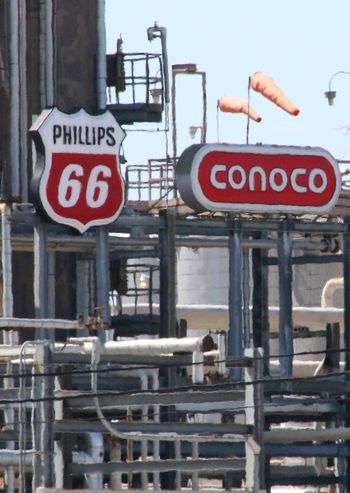 As a result of a settlement between OSHA and Phillips 66 Company, OSHA agreed to delete the willful characterization of the citations and Phillips 66 agreed to pay a $4 million fine and to institute process safety management procedures at HCC and the company's sister facilities at Sweeny, Texas; Borger, Texas; and Woods Cross, Utah. Think Reliability performed a root cause analysis of the accident in 2009 that determined the underlying reasons behind the Phillips 66 Explosion of 1989. 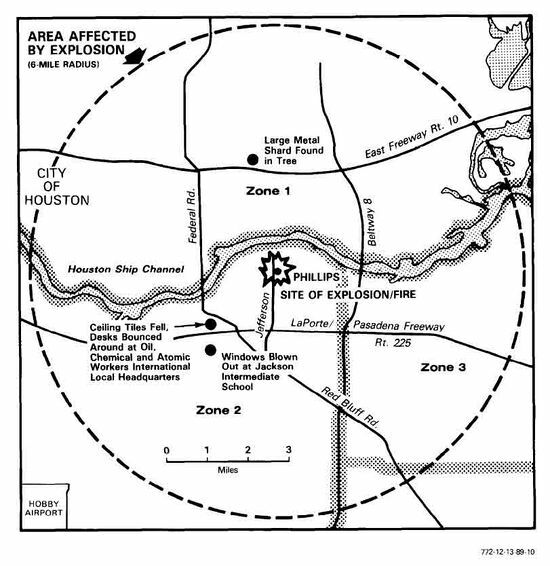 Looking at the Phillips 66 Explosion Cause Map, one can see how a series of procedural errors occurred that fateful day. Contract workers were busy performing a routine maintenance task of clearing out a blockage in a collection tank for the plastic pellets produced by the reactor. The collection tank was removed, and work commenced that morning. However, at some point just after lunch, the valve to the reactor system was opened, releasing an enormous gas cloud which ignited less than two minutes later. The subsequent OSHA investigation highlighted numerous errors. First, the air hoses used to activate the valve pneumatically were left near the maintenance site. When the air hoses were connected backwards, this automatically opened the valve, releasing a huge volatile gas cloud into the atmosphere. It is unknown why the air hoses were reconnected at all. Second, a lockout device had been installed by Phillips personnel the previous evening, but was removed at some point prior to the accident. A lockout device physically prevents someone from opening a valve. Finally, in accordance with local plant policy but not Phillips policy, no blind flange insert was used as a backup. The insert would have stopped the flow of gas into the atmosphere if the valve had been opened. Had any of those three procedures been executed properly, there would not have been an explosion that day. According to the investigation, contract workers had not been adequately trained in the procedures they were charged with performing. Additionally, there were significant design flaws in the reactor/collector system. The valve system used had no mechanical redundancies; the single Demco ball valve was the sole cut-off point between the highlypressurized reactor system and the atmosphere. Additionally, there was a significant design flaw with the air hoses, as alluded to earlier. Not only were the air hoses connected at the wrong time, but there was no physical barrier to prevent them from being connected the wrong way. This is the same reason North American electrical plugs are mechanically keyed and can only be plugged in one way. It can be bad news if connected incorrectly! Connecting the air hoses backward meant the valve went full open, instead of closed. Both of these design flaws contributed to the gas release, and again, this incident would not have occurred if either flaw was absent. 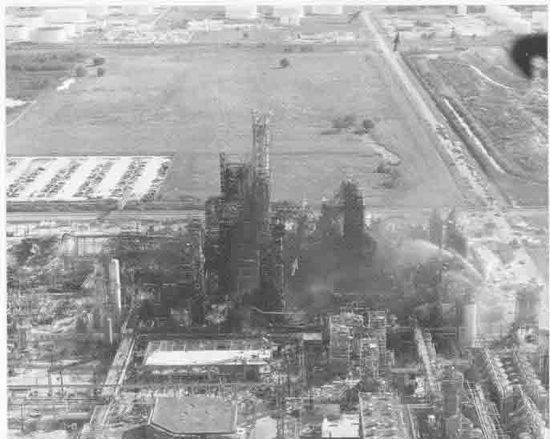 Two workers were killed and three men were injured in an explosion on the morning of Wednesday, June 23, 1999, at Phillips Petroleum Co.'s K-Resin Chemical plant in its chemical complex at 1400 Jefferson Road, Pasadena, Texas. An alarm sounded at 11:30 am when the blast occurred and a fire erupted. It took more than an hour for Phillips' onsite fire department to extinguish the blaze. Those killed were 24-year-old Juan Martinez and his uncle Jose Inez Rangel, who were performing a hydrostatic test on pipe until they were burned to death by 500-degree F molten plastic. Both Martinez and Rangel were employed by Zachry Construction Corp. Today, the facility continues to manufacture high-density polyethylene (HDPE), as well as K-Resin SBC. This complex employs 750 workers for the production of specialty chemicals, including 150 operations and maintenance personnel. A massive propane leak occurred on 25 June 2008 in a utility easement just outside plant property. 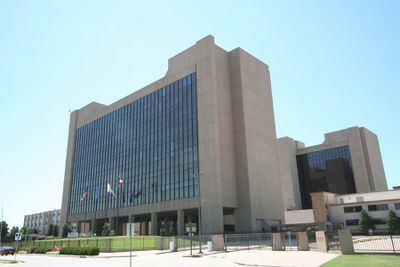 The Pasadena site was home to the 1989 Phillips Explosion, which killed numerous employees and contractors after cost cutting efforts by the company. The initial explosion was equivalent to 2.4 tons of TNT exploding, damaging the homes of residents within an eight mile radius of the refinery. The initial explosion mushroom cloud was visible to area residents within a 15 mile radius of the site. The Occupational Safety and Health Administration officials fined the company $204,000 for 13 alleged safety violations. The Phillips complex also had explosions in April 1999, when a rail car containing polypropylene blew up, and in August, when there was an explosion in the polypropylene section of the plant. One worker was killed and 71 were injured after an explosion and fire occurred approximately 1:22 p.m. CT on March 27, 2000, at Phillips Petroleum's Houston Chemical Complex at 1400 Jefferson Road, Pasadena, Texas. The fire produced huge plumes of black smoke that spread over the heavily-industrialized Houston Ship Channel and neighboring residential areas. The explosion occurred at the K-Resin facility and involved a type of plastic made with butadiene. At the time of the explosion, the tank was out of service for cleaning and had no pressure or temperature gauges that would have provided the workers with an alert to the approaching crisis. Ultimately, this explosion resulted in one fatality, while 32 Phillips Petroleum employees and 39 subcontractors were taken to local hospitals for sustaining burns, smoke inhalation, and cuts from debris. It took search crews five hours to locate the body of a missing employee in the rubble. The dead man was Rodney Gott, a 45-year-old supervisor, who barely survived the Phillips Disaster of 1989. At that time Gott was in a building whose roof collapsed but he remained in the blazing plant to save a woman and attend to the injured. On April 14, 2000, State Sen. Mario Gallegos Jr. asked state and federal officials in Texas for a criminal investigation of Phillips Petroleum Co.'s plant in Pasadena after the explosion that killed one worker and injured 74 others. "Nobody asked me to initiate this," said Gallegos. "If there is a hellacious explosion, all the businesses along the channel are at risk. You've got to feel for the families who live and work around here. I hope something is done." The Occupational Safety and Health Administration's six-month investigation concluded that failure to train workers properly was a key factor in the explosion and fire, and it proposed that Phillips Petroleum be fined $2.5 million in penalties for 50 alleged violations of safety standards at the facility. OSHA determined that the March explosion took place when a runaway chemical reaction occurred in a tank containing an unknown quantity of butadiene that burst the 12,000-gallon vessel. This explosion resulted in a fire and damage to other nearby chemical tanks. The butadiene tank was out of service for cleaning and had no pressure or temperature gauges that could have alerted workers in the control room to the impending hazard. More importantly, workers had not been trained in safety procedures for handling butadiene, and they were unaware of the potential for explosion. In addition, while the vessel was not in use, butadiene continued to flow into the tank through a non-functioning valve that had not been properly locked out. "Unfortunately, this tragedy is not an isolated incident, but one in a series of incidents at this site," said Labor Secretary Alexis M. Herman. "Three workers lost their lives in explosions at this plant in less than a year's time, and 23 others were killed in a major explosion in 1989." OSHA Administrator Charles N. Jeffress said, "We have cited similar violations again and again at this plant, yet tragedies continue to occur. What is really needed here is a full reassessment of worker safety and health in all areas of the plant, significantly improved training for employees and a firm commitment from plant and corporate management to make safety an ongoing high priority. We recognize that the plant is now under new ownership, and we look to the new owners to assure that the problems of the past do not continue." As a result of the inspection, OSHA has alleged 30 willful instance-by-instance violations for failure to train plant operators with a total proposed penalty of $2.1 million ($70,000 per instance); four alleged willful violations of process safety management and lockout/tagout standards with a proposed penalty of $280,000; two alleged repeat violations of the process safety management standard for a proposed penalty of $70,000; 13 alleged serious violations with proposed penalties of $66,000; one other-than-serious violation with a proposed penalty of $1,000 for a total of 50 alleged violations with proposed penalties of $2,517,000. Willful violations are those committed with an intentional disregard of, or plain indifference to, the requirements of the Occupational Safety and Health Act and OSHA regulations. A serious violation is defined as one in which there is a substantial probability that death or serious physical harm could result, and the employer knew or should have known of the hazard. Repeat violations are those in which an employer has previously been cited within the last three years for the same, or a substantially similar, violation and which has become a final order and not under contest. ↑ "Explosion and Fire at the Phillips Company - Houston Chemical Complex" Document Accessed on December 4, 2007. ↑ OSHA "Investigation conducted by OSHA at the Houston Chemical Complex" February 12, 1991. ↑ Los Angeles Times. "Phillips Fined $5.7 Million for Blast at Refinery : Energy: OSHA cites the oil company for 575 safety violations in connection with the explosion that killed 23 and injured more than 130." by Michael Parrish. April 20, 2990. ↑ Root Cause Analysis. "The Phillips 66 Explosion: The Rise of Process Safety Management in the Petrochemical Industry" 2009. ↑ Plastics News. "Explosion Kills Two at Phillips K-Resin Plant" September, 2010. ↑ Southern Studies. "Tort Reform Lone Star Style"
↑ Edgar Online. K-Resin Facility Incidents. ↑ Chevron Phillips Chemical Co. LLC - Worldwide Operations.Access Date: February 22, 2008. ↑ KHOU-TV, Inc. "Pasadena propane pipeline springs a leak" June 25, 2008. ↑ KTRK. "Accident sparks propane leak near plant" June 25, 2008. ↑ WSWS. "Phillips Petroleum plant explosion: the latest in a series of deadly accidents at Houston facility" Accessed on December 9, 2007. ↑ "The Aftermath of a Deadly Explosion: A Rhetorical Analysis of Crisis Communication as Employed by British Petroleum and Phillips Petroleum" Accessed on December 9, 2007. 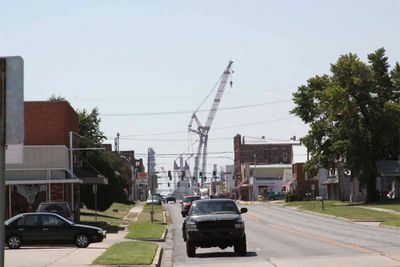 ↑ Phillips settles fatal explosion case -- Federal penalties $2.1 million. Access Date December 9, 2007. ↑ NewsOK. "Phillips plant's safety questione" April 14, 2000. ↑ University of Houston. "Worker Death Toll Mounts at Houston Petrochemical Plants" Access Date December 9, 2007. ↑ OSHA. "Investigation of explosion that killed one worker, injured 69" September 21, 2000. This page was last modified on 6 April 2015, at 16:09.